Half a DECADE of straight sugar shreddage!!! 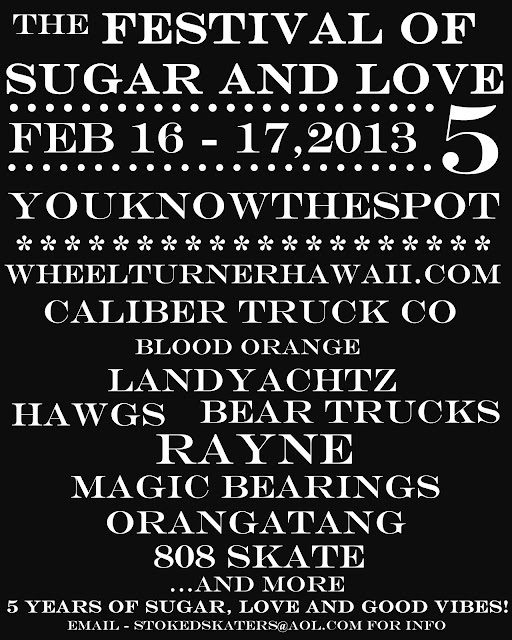 Everyone get ready for the Festival of Sugar and Love 5. On February16 - 17, we will be doing the dang thing. Same spot, same jam style, but an all new time of day! Like always we will have group free ride jam sessions and narrow it down through out the festival till we have our 1 vs 1 Final. Riders will be judged on their speed, style, originality, consistency and a number of other factors, the more well rounded you are the better. Dub Kick? Speedboard? Both? No mattah! If you BRING IT, you will be recognized! The only thing that will be a bit different this year... the majority of the event will be NOCTURNAL! We will be gathering in the noon to set up camp, and right near sunset we will get shredding through the night! You will NEED to PRE REGISTER by emailing StokedSkaters@aol.com with your name, age and ID number by February 10th at the LATEST. Those who aren't registered to stay over night will not be able to participate... sorry. The will be no leaving the camp grounds once it is dark, we do not want to disturb the near by neighborhood. Helmet and slide gloves are REQUIRED... full pads are encouraged. This is a NO SPECTATOR event, please keep it to riders only. GET YOUR REGISTRATION IN NOW, you won't wanna miss F.O.S.A.L 5. Email - StokedSkaters@aol.com before Feb 10th to register.